Take a walk with me on Brooklyn Bridge, New York City! 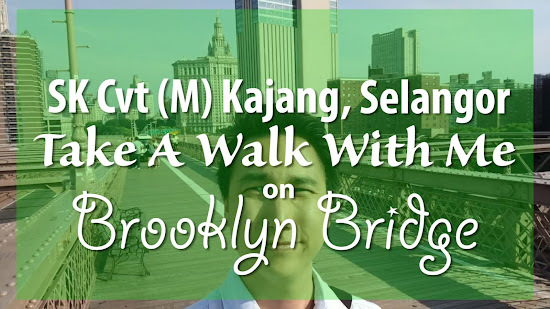 Dedicated to the students of SK Convent (M) Kajang in Selangor, who voted for the landmark, here's another video in the Walk With Me In NYC series! In this video, I take you on a walking tour of Brooklyn Bridge & share with you the story of the most recognized landmarks in the world. You will also see City Hall Park, Manhattan, Brooklyn, DUMBO, East River, & Manhattan Bridge. This video was produced in collaboration with Cikgu Nurhazirah Azhar of SK Convent (M) Kajang, Selangor. 1. What is your favorite bridge in your city/state? Why do you like that bridge so much? 2. What are the pros & cons of building bridges which inspire? 3. What should bridges prioritize - pedestrians, cyclists, public vehicles, or private vehicles? New York City is such an inspiring place. Countless movies have been made here. Famous celebrities like Godzilla have been here. It's so amazing that jealous alien races, like the Chitauri, want to destroy it. I've learned & grown so much as a human being immersed in its culture & living amongst its people. I want to share those benefits with all students in Malaysia & inspire them to be global citizens, as well as motivate them to constantly improve their English language proficiency. So come, Malaysia, walk with me in NYC. Buat Apa Di USA? Bercuti Dibayar Ka?